BikeSkirt » Blog Archive » Soma-riffic! You guyssssssssss, my Soma Buena Vista is finally complete! 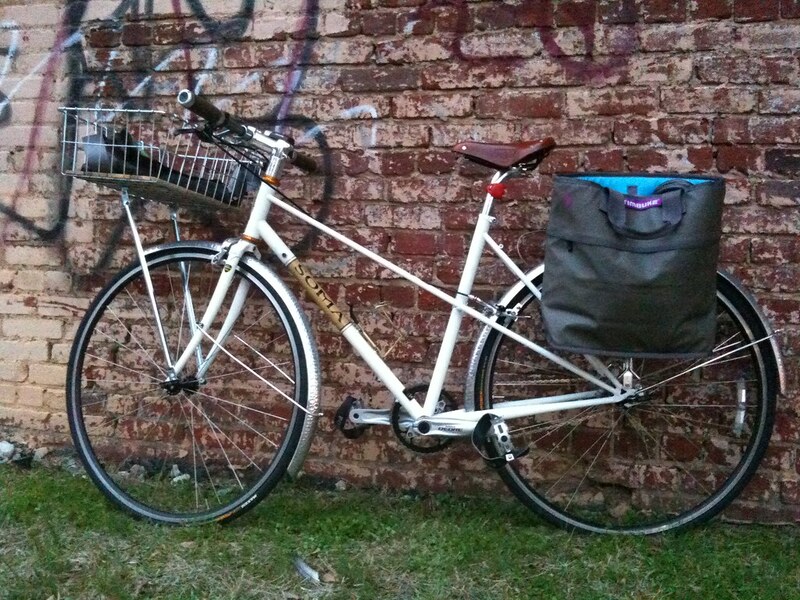 Timbuck2 was having one of those mega sales and I could not resist the panniers at 50% off. Of course, you need a back rack to go with the panniers, and while I was at it might as well go ahead and get the front basket. I had planned to get the Wald Woody set from the beginning, but couldn’t commit until now. Photos!!! Both racks didn’t just pop on there; it seems like every step of the way we ran into snags before we could get stuff to work right – fenders rubbing on the frame and breaking, tires not fitting, bars too big, and now having to adjust and find different means of attaching the racks, but I suppose that’s what goes in to building your own bike from the ground up. It’s been a learning experience, that’s for sure. 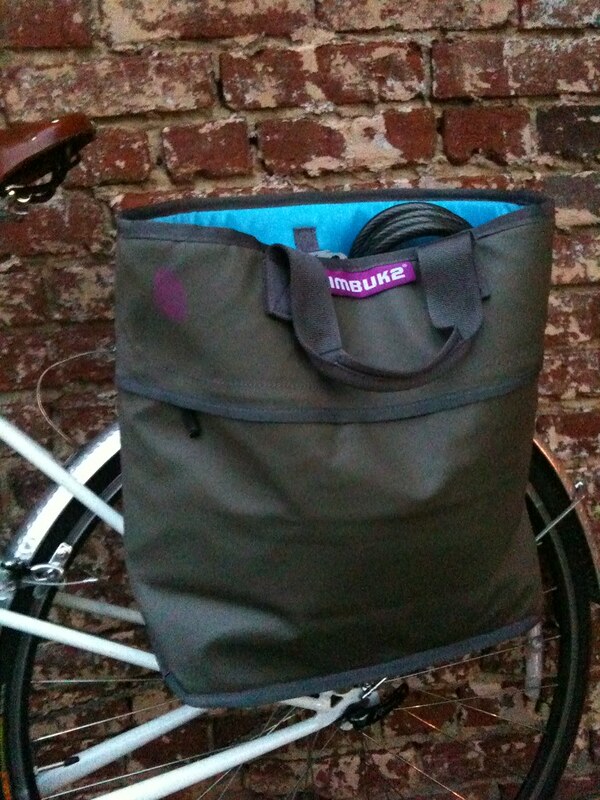 I decided to get these panniers because they are super easy to remove and carry for shopping purposes. I went to the grocery store yesterday after work and it was awesome! I felt like that final step toward bikey perfection had been taken. The only down side is now my bike weighs a whole lotta pounds. 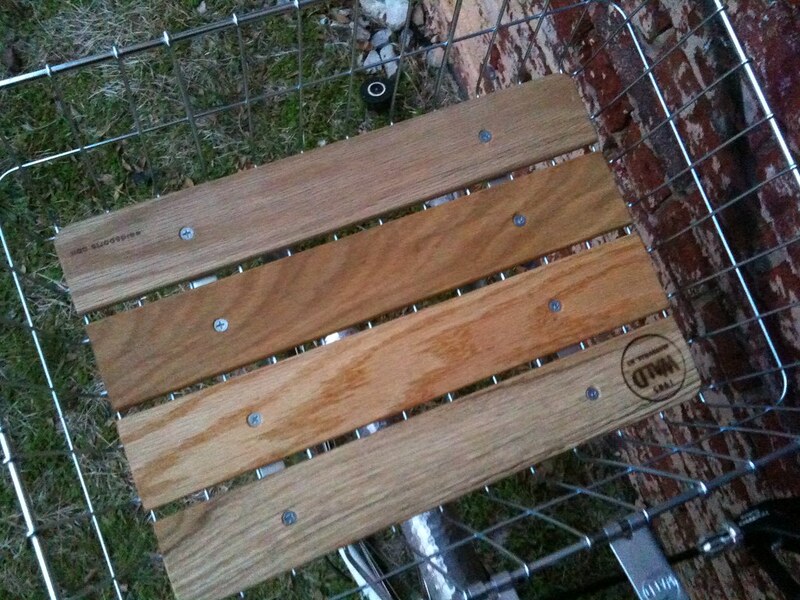 Those wood slats are cute to boot, but not made for the speed demon in me. While riding it’s a bit more difficult to get going and steering has been a bit more cumbersome, but the bike is single speed so I can only go so fast anyway and I’m learning to ride in a more chill way. 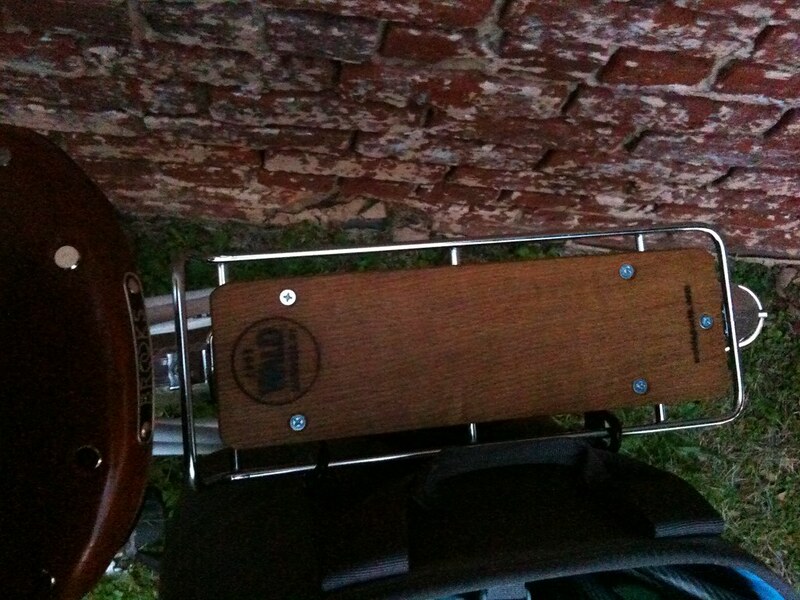 It’s quite a trial getting this guy up and down the stairs at my home, especially laden with groceries. HOWEVER This bike is so worth it. I.LOVE.IT. Couldn’t be happier! In the future I might get different cranks and new bars…and maybe a wheelset with gold Chris King hubs (ha, donations anyone?) but it is exactly what I dreamed up when I first decided to purchase this frame about a year ago. Wee! Just BEAUTIFUL! 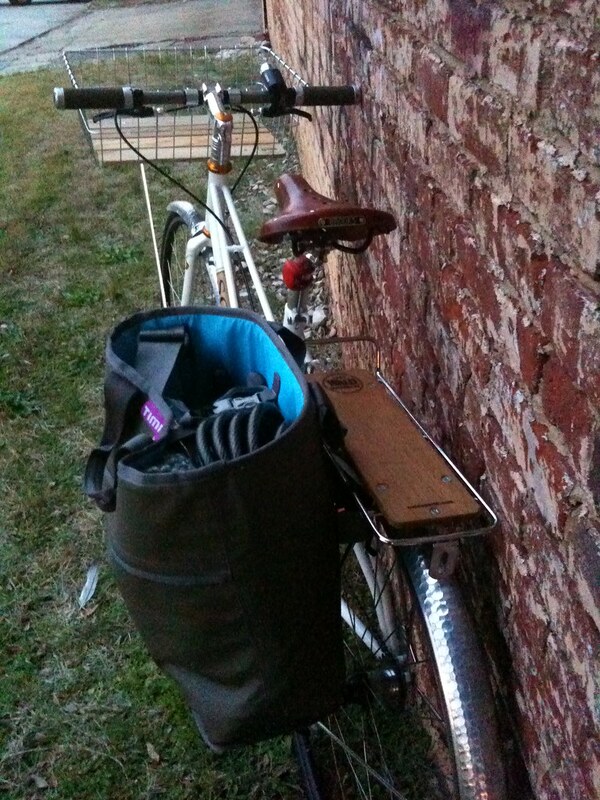 I’m building up a Soma Mixte too — I got the graphite gray one… can’t wait to get it rolling! Look at moving those lotta pounds as training. When you switch over to your speed-fiend for long weekend rides or races, you’ll feel a lot like you are flying. Just remember to remember how to spin. I didn’t even know Timbuk2 had panniers. Those look huge and durable. 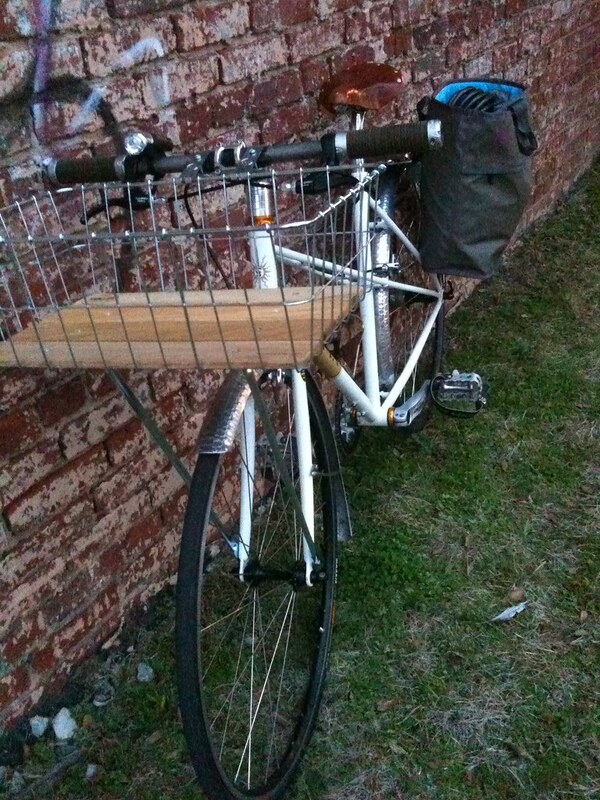 I also like the way the wood rack and basket compliment your saddle. I’ll be curious to see what bars you switch to and other component changes you might make in the future, but it looks like you’ve sure got yourself a fantastic ride. looking forward to hearing more about your SOMA BV, I am considering one. good to hear you like it.